....which is a fancy name for a bit of fun. Fun with a point, though. It definitely has a point. Anything you can do which will add to the meaning of what you are trying to convey when you are scrapbooking has to be a good thing, right? Sooo if you have a photo which is all about place, the theory is that your story will have more punch if you can grab that place and spread it all over your layout. Put the place in the composition. 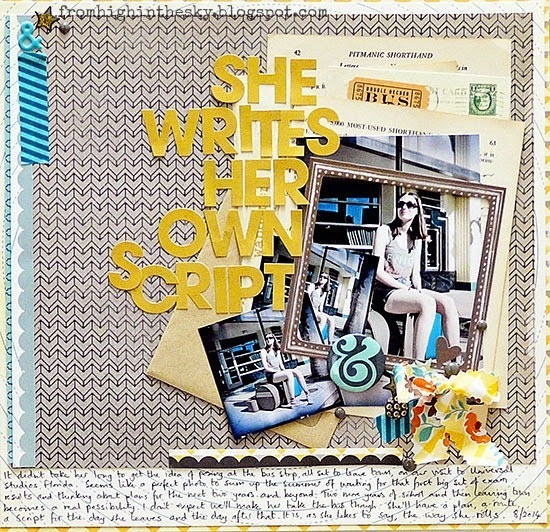 That could be by scrapbooking on a map, maybe, or by taking the background elements in your picture and extending them over your page in your embellishment choices, or by replicating the setting of your photos right across your layout. So here she is, that girl of ours, at Universal Studios. Did Judy Garland ever pile her suitcases up at a bus stop and sit, ready to leave town? I don't know. And I don't know why I thought of Judy Garland when I asked The (Not So) Small One to pose. I knew she'd get it though, that look I was after. As I snapped, I realised what perfect pictures they were to mark her summer. She's not quite ready to leave us yet; but she's certainly getting ready to consider it. A summer of transition. And when I printed out the photos and Get It Scrapped asked me to get all compositional, I took the story from the setting. We'd simply been playing about on a film set at the beginning. It was only after I'd taken a few pictures that I realised I'd been telling the story unconsciously. Through her summer of choices she has been writing her own script, doing it her way, and it took a set of fake suitcases and a model bus stop to show me just how well she can do it too. Suitcases, waiting for a bus to a whole new life? It's a film set, so I edited my photos to get an old film look, layered up old book pages to look like piles of scripts and papers on a director's desk and added a bow in a 1940's print. Because if Judy Garland did sit at a bus stop? she probably wore a frock. What a gorgeous photo of your girl. Loving that title and all the "supporting roles" for your leading lady. 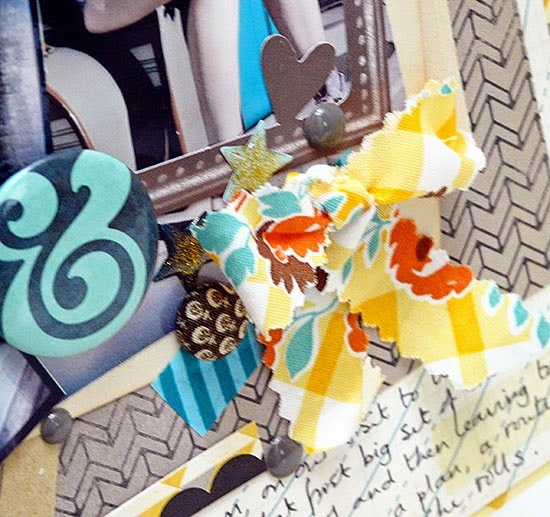 A fabulous layout, muted colours apart from that lovely yellow and blue and that bow is just gorgeous! LOVE this! especially that title! An amazing page and an amazing photo. Love the story here. They grow up so quickly but it is a wonderful feeling to watch them grow into adulthood. Everything about this page is so great! I love all the meanings behind it and the title rocks! Two thumbs up! Everything and I mean everything I love. From the blog post, the layout and that gorgeous photo. Oh nicely done, right down to the little stars, you've captured a bit of Hollywood there. Everything about your post is great Sian, the photo, story, layout. You get it so right, just like your girl! It's so exciting watching them grow and surprise us. I was so worried about their teenage years and thought they would just be the rocky road you hear about. I have found it to be just amazing seeing their adult personalities emerge in surprising ways. Of course there are the odd bumps to be navigated but much, much more interesting things most of the time. Great LO! Every little piece. Wonderful story & awesome realization. You have such an incredible knack for making every little bit in your layouts count toward the story you are telling. This one is fantastic! Love the page....and what a great title. Great idea!! I love the little bus ticket and the post card---perfect touches. Yes, she looks like she's ready to embark upon her future!! 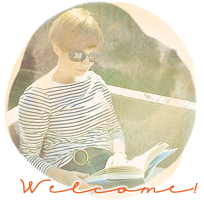 Love the idea behind your layout Sian...and the layout itself! Wonderful photo and great story behind the layout. Your attention to detail blows me away time after time. I love so much about this (including the very apt journaling), but the layered photos are something I don't think I would ever think to do, but I'm pinning this so I don't forget. Great layout and lovely title. I do think you've conveyed the feeling of the photos perfectly with your layout & it does appear she's getting ready to move on in the coming years. Gosh, she is growing up so fast - very much the young woman here, with the world at her feet :). I love your use of yellow and neutrals here. Almost looks like grey from a distance ... and I think we both love that colour? Beautifully composed - the photo, your thoughts, and your lovely daughter. BIG TITLES for the win!! I love everything about that layout. and story. need to grab some yellow alphas now! What a terrific layout and such hidden meanings that popped out at you when looking at them. Hard to believe she's looking at higher education options already.